US Congressman Porter Goss, nominated to be the new director of the CIA, may be talking himself out of the job, according to film-maker Michael Moore. Moore, who directed the film Fahrenheit 9/11, has released an interview with Mr Goss in which he says he lacks the qualifications for the top spy post. "I couldn't get a job with CIA today. I am not qualified," Mr Goss told Moore's production company in March. The White House has dismissed the interview as "ridiculous hearsay". The interview did not make it into the final edit of the film, which criticises President George W Bush's policy on Iraq. But following Mr Goss's nomination by the president, Moore has released the transcript and video excerpt on his website. "I don't have the language skills. I, you know, my language skills were romance languages and stuff. We're looking for Arabists today. I don't have the cultural background probably," Mr Goss says on the video. "So, the things that you need to have, I don't have." Mr Goss, 65, is a former officer with US army intelligence and the CIA. He represents a Florida district and has served in Congress since 1989. 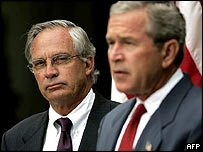 Announcing the appointment on Tuesday, Mr Bush said Mr Goss was the "right man" to head the agency. "Porter Goss is a leader with strong experience in intelligence and in fighting against terrorism," he said. Mr Goss is due to replace former director George Tenet, who stood down, citing personal reasons, before the commission investigating the 11 September 2001 attacks issued its report. The bi-partisan panel blamed intelligence bodies, including the CIA, for failing to predict or avert the hijackings.